Rakesh Trivedi lives in a small village. His father works as a train's ticket agent, and wants the same for Rakesh. Despite this, Rakesh longs to invent the one big thing that will prevent him from ever working a common 9-to-5 job. Vimmi Saluja is a Punjabi girl who spends her time watching films and supermodels to become a future Miss India. Soon, her parents explain that they have arranged her to be wed to a young man with a decent job. Simultaneously, Rakesh's father demands that Rakesh go in for an interview or leave home. Both characters pack and leave in the night, encountering each other by the train station, and quickly become friends. Each supports and encourages the other's dreams; Vimmi gets thrown out of a pageant for arguing, while Rakesh is turned away from a would-be investor. Further, a man from a restaurant siphoned ideas from Rakesh's presentation, learning from the interviewer that someone earlier had brought forth the same ideas. Rakesh and Vimmi trick the man out of money they believe to be theirs by justice. Conning people proves easy money, with the pair pulling schemes to afford a trip to Bombay. This lifestyle becomes too exciting to stop. The two take the aliases of Bunty and Babli, pulling off scam after scam against the rich. These activities put the names into newspapers across the country. Soon the partnership leads to romantic feelings, with the two shifting their scams to let Bunty and Babli pose as married. However, ACP Dashrath Singh is slowly closing in on the pair, relentlessly hunting them across India. Rakesh and Vimmi eventually have a child, with a close call dodging Dashrath, leading them to quit con jobs. This actually leads to their capture. In holding, the lovers' confessions tug at the detective's heart, earning their freedom as Dashrath feels they will never con again. The film ends several years further, Rakesh and Vimmi now help the authorities with counter-scamming jobs. 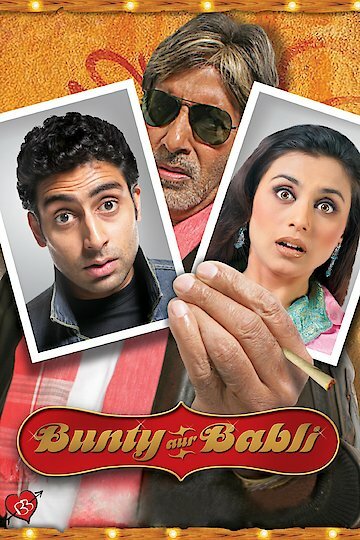 Bunty Aur Babli is currently available to watch and stream, download, buy on demand at Amazon Prime, Google Play, iTunes, YouTube VOD online.